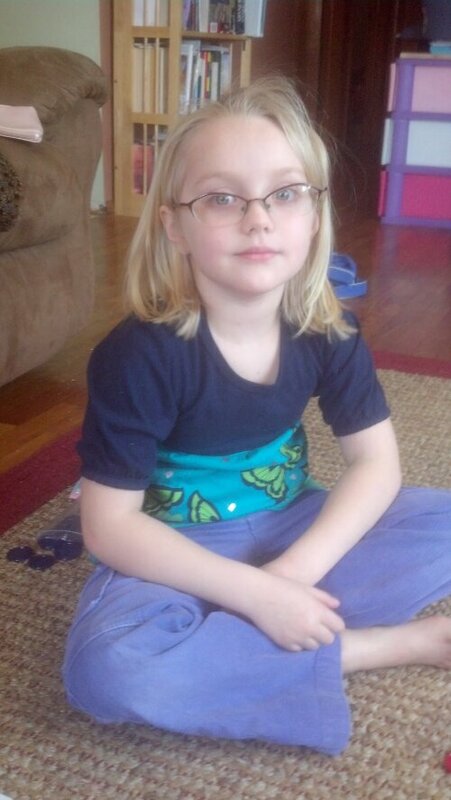 This winter, testing showed that M had significant trouble focusing her eyes. They would not track properly or work together…when required to focus on an object up close her eyes would start to shake, then her left eye would turn away in the other direction or up into her eyelid. Her eyes had to work very hard to not see double, and she was sometimes seeing double anyway. The doctor wanted to wait 6 months to see if she outgrew this convergence insufficiency, but warned she could get worse quickly and to come back if she had a hard time with school work, complained of headaches or double vision, etc. M cried all that evening from eye fatigue and went to bed early. She seemed to steadily decline from there, complaining throughout the day at school (especially ‘close work’ times) of eye pain, then headaches, then blurred vision and occasional double vision. At home she refused to do any writing/drawing homework, but I was unsure if that was due to her fine motor or vision problems. Today I explained all of this to the optometrist and he did some more specific, in-depth testing to check her tracking/focusing abilities. It was even worse than we thought. Her ability to use her eyes together to focus and track is significantly impaired, to the point that even the doctor was surprised that she is doing as well as she is. At this point, to take the strain off of her eyes, we are going to use glasses with low level, light lenses. She will go back in a month to see if that is enough, or if she needs additional help such as higher level lenses and/or vision therapy. She may outgrow this impairment in a year or two, or she may not. Right now the concern is to help her be able to focus and see comfortably enough to learn in school and do her work, and to preserve her vision (in extreme cases of C.I. you may lose vision in one eye as it shuts down to keep from having double vision). I am so glad we are on the road to helping M with her vision. I am also thankful that she is not concerned about wearing glasses. I assured her no one will make fun of her (most kids actually think glasses are cool) and she has been using mine to help her read, so she knows how much better she will feel. I am also glad I made the unconventional choice to take her to the developmental optometrist (last year she had just had her preK vision screening and it turned out fine). I am hopeful…who knows what all symptoms are caused by the pain, fatigue and frustration of trying to see properly, and might be improved with glasses? I can’t wait until she gets them next week and can start having relief! A little over a year ago M started complaining that it was kind of hard to see things sometimes. She had just had her preK eye screening at school but I knew that is a very basic screening and decided to take her to an optometrist to make sure. This was also right before her appointment with the Neuropsychologist for the Autism diagnosis and I wanted to make sure everything else checked out before going through 2 days of in depth testing. Fortunately, with referrals from friends, I found a wonderful developmental optometrist in town who works with children and special needs children and also does vision therapy, in our town! After a full examination he determined that her vision was normal but her ocular motor development was delayed. He explained that this was normal with fine motor delay (her fine motor is/was in the 2nd percentile, and ocular motor develops after fine motor). We decided to wait a year, until after she had a semester in Kindergarten, to give her motor skills time to develop and check again. This winter a month or so before her eye appointment she started to complain her eyes were hurting, and her eyes were often red and watery. Another full exam revealed that her eyes had become worse with serious problems in tracking and focusing. She has what is called Convergence Insufficiency, which is like “lazy eye” but it only occurs when she needs to track or focus, like when trying to read, write or draw, or even sometimes watch TV or play games. She often sees double and her eyes tire very easily. When she tries to focus close up, her eyes shake and her left eye moves outward in the opposite direction or rolls around, unable to focus and work together with her right eye. The doctor suggested waiting 6 months to see if the problem corrects itself but warned me it could also get worse quickly. After the appointment her eyes were so worn out she just cried all evening, had a bad headache and went to bed early. Since then she complained every day increasingly of eye pain and difficulty concentrating. Then she began to complain of headaches and things looking blurry. Most recently she has also complained of double vision (I think she finally has words & understanding to describe what she is seeing). 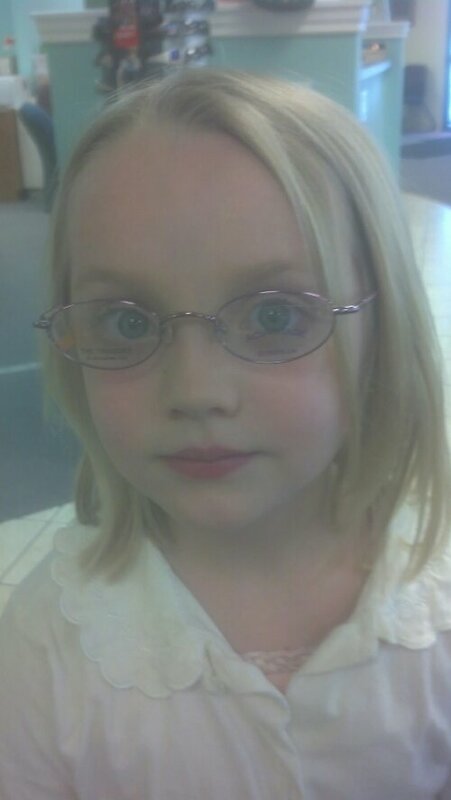 I wear glasses that have prisms (which is what she will need to help her eyes strengthen and work together) and after trying them once when reading she begs to wear them all the time to make her eyes stop hurting or to do close work. She also tried on Russell’s glasses and said they don’t help at all…and they don’t have the prisms, which shows me that it really is helping her. Although it has only been just over 2 months I called and moved her appointment up to later this month. I don’t think we can make her wait any longer for glasses and vision therapy. I also believe a lot of what we thought was fine motor delay (difficulty writing and drawing, using her hands to eat instead of utensils) could actually be due to her vision problems. Also some issues we thought here anxiety such as constant stomach aches could be due to her eyes, as the double vision could cause her dizziness and nausea. I hope the doctor will agree to give her at least glasses now to provide her relief for her eyes, because I hate seeing her in pain all the time and I really think this problem is holding her back from meeting her potential. Being able to see properly could even get rid of the aggression she still sometimes displays. Please pray for a good result and help for Margaret in the coming weeks as we try to get her what she needs to see and feel better.